« How Many Apples On The Apple Tree? This is a super basic activity to set up yet was one of the more challenging for Andrew. 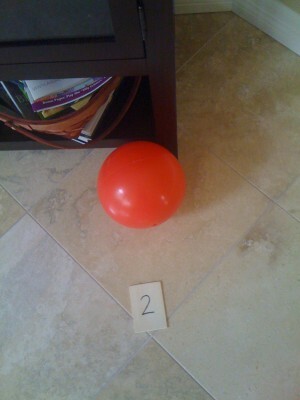 I set out a red plastic bouncy ball (the “apple”) for us to pass back and forth 10 times. A red balloon would also work well for this activity and you could make it as big or as little as your child is ready for. Of course, I told him that we wouldn’t want to drop it or throw it too hard or it could fall and get bruised (a little pretend play here!). The addition of two dice can help determine how many times this needs to be done, plus helps to build fine motor skills of shaking and rolling the dice while incorporating counting and adding the two numbers together. If this is challenging for your child, begin close together so that they get the practice of hands out and squeezing to catch the ball. I especially liked to use red when Andrew was working on this because it is an easy color to see and track. Once your child gets the hang of it, try it against a wall. It will probably come back faster and require a little quicker reflexes but if they are ready, go for it! Bouncing was a huge challenge with Andrew’s motor planning issues so we started with him bending over or squatting while holding the ball so that the ball was only a few inches off of the ground. He would just have to let go and then work on catching the ball which was easier because his hands were right there in a good position to catch. We also did some hand over hand at first to show him how his hands would have to move to let go of and grasp the ball. From there, he slowly worked on standing up a bit more until he got how to push down on the ball to bounce it and then get his hands ready for the catch. We are still not perfect with this but practicing and building from really basic steps helped him understand what his body needed to do as well as figuring out the timing of it all. A good way to practice rolling is to sit with legs out in a V shape with your child facing you doing the same thing and touching your feet together so the ball cannot roll away. Note: I am not an Occupational Therapist. These are just ideas and suggestions that worked for us at home while building these skills. If your child sees an OT, ask them for recommendations on how to build ball skills they are working on in therapy at home.